These lenses all cover a full frame sensor as used in the Sony a7, a7r, a7s, a7II, a7rII, a7sII and a9. They can of course be used as well on APS-C cameras like the Sony a6000 or a6500 but with a narrower field of view. These lenses do not cover the full frame, they are meant to be used with Sony’s APS-C cameras like the a6000 or a6500 but you can use them in crop mode on the a7/9 series. Any views on the new Sony 85mm/F1.8 versus the older 85mm G.Master. I am literally just walking in to the Sony ecosystem and am very keen to get one at this focal length for portraiture. I am also looking to get something in the 35mm range. A little homework tells me that the Sigma 1.4 35mm might be the sharpest one, even when compared to the Sony’s native lens. Thanks you your blog, I have a decent array of Minolta’s in the 50mm range. Any other recommendations on what other native lens I should get shall be very much appreciated. I haven’t really looked in the new FE 1.8/85 yet so I don’t really haven an opinion on it. For a 35mm lens I am a big fan of the Voigtlander 1.7/35. Many thanks for your prompt response. Just finished reading through your EXCELLENT review of the FE 16-35. Its one of the lenses I am thinking about. Do you think it makes sense to get it alongside a 35mm prime? I do not want to go crazy in the GAS (Gear Acquisition Syndrome) however I want to get a good lens. I was initially thinking of getting a used Canon 16-35 and adapting it to Sony however the more I read, the more I am leaning toward getting a native for auto focus especially because the price difference isn’t much (Sony-Trade-in Promotion). I look forward to your review of the new 1.8 85mm versus the G.Master especially considering the almost $1000 dollar difference. I am sure the bokeh alone cannot be worth the additional$1k but I am not expert and would need guidance. Don’t expect a review of the FE85 too soon, I am more focused on manual lenses at the moment and Jannik who owns the GM85 is so happy with it that he won’t be tempted to try the FE85. Hahah, I believe that feedback from Jannik to be consistent with the wider set of users. Thank you for your responses again. Can someone know if bombo lens adapter for voigtlander 12mm E mount be able use Lee filter holder 100mm? I mean I just need the bombo lens adapter and Lee 100mm filter holder. I would be very suprised if that would work. Do you guys have any plans to test the SEL1224g andthe Voigtländer 12mm E Mount version? The 4/12-24 seems to be an awesome lens with stronger corners than the Voigtländer but not as great flare resistance or sunstars. But I am note sure that we will have a review of it too soon. Yes I can imagine Jannik has his hands full at the moment. 😉 Look forward to a review of the FE 4 12-24. I might rent one in the meantime to see what it’s like. Any chance you will review any more APSC lenses?Like the 35mm 1.8?Or sigma 30 1.4?There are a lot of reviews out there,but I love the way you do yours,and it will be very helpful for me to decide between the two. We are four now and still we can’t cover all the native FF lenses. So I would like to help but I don’t have the resources to review those lenses. hi Phillip, I have been building my gear, is been hard since it is expensive (at least for me) but do not want to compromise quality or wish i had gotten this instead of that. I did a lot of research and got me the sony A7r2 and the 35mm 1.4 distagon ZA. I am pretty happy with the combo. although wish they were smaller but they perfomance justifies the size and weight. I want fast, primes with excellent quality picture. what would you suggest to have a fair combination of lens? Apart from the 5.6/10 these lenses are best in class. The 5.6/10 is only in class and therefore best in class as well but a bit softer in the corners. The significantly less wide, G 4/12-24 has better corners but it is larger with weaker flare resistance. seems like you think highly of the 85 loxia and the 65 Voightlander, and if you add the 85 1.4 GM, in your personal opinion, would be a better choice. apart form price ? If you shoot a lot of portraits tje GM would be the better option. Because it is so big and heavy it only makes sense if you make good use of the fast aperture. 85 1.4 is pretty limited to portraits, because of the size, and weight. while the 65 is versatile, smaller, cheaper, less obstructive, and cheaper. yet awesome performance. so it would make sense to buy it as well. your review reminds me of car reviews is not only the engine, but overall, as far is price, MPG, insurance, resale value, performance and etc. not just looks. thanks for taking the time to answer our questions Phillip, very kind of you. or better yet using the 65 as 50 and buy the 85. now the dilema would be between 1.4 or 2.4 LOL. I’ve been visiting your site for a few days now. Really interesting and useful reviews and links to your awesome Flickr page too! I’m a hobbyist who is getting himself a Sony A6500 for Christmas and wondered if I could seek your advise re lenses. 3. Would you suggest getting an “all around, everyday lens” that could do both 1 and 2? 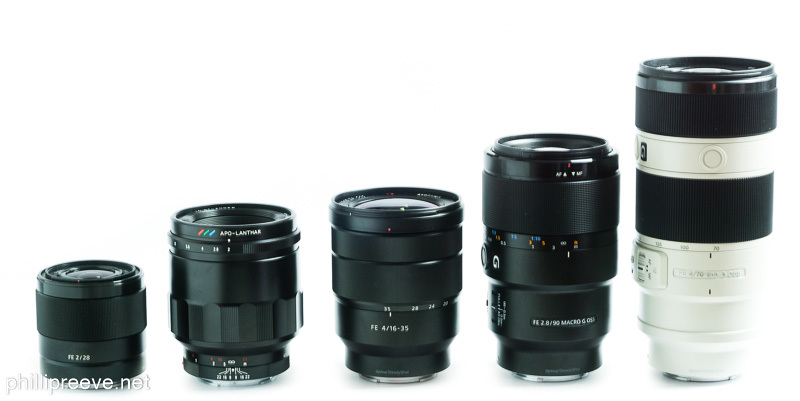 Have a look at the Sony 4/10-18 and the FE 1.8/85. Personally I would not go for an all in one lens but that is a matter of taste. No experience but from what I have read it is quite good. Hey, I really wait on pins and needles to see your review of FE 24-105 f4. You guys have best FE lens review website. The new Sony 12-24 FE has received many positive comments. I would greatly value your review and comparisons to a few intelligently chosen for best quality primes in the same range. Can this lens compete in the corners? hi there, any recommendation for landscape/astro photo with out breaking the bank and wider than a 24mm. Currently I am using a 24-105/f4. Love the website and i hav ebeen devouring all the blogs. Any recommendations on Superzoom telephoto lens – Tamron or Sigma 150-600 with A7ii? Can Metabones adaptor effect performance? We haven’t used any of these. Apart from the 3.5-5.6/28-70 Kit zoom there are no others in E-mount. What an excellent resource. Thank you! I just discoverd your blog and I’m really impressed with the work you’ve done. It’s kinda rare to see people reviewing lenses while taking great pictures. I wanted to know, I just bought a A7iii and a 24-105 f4 coming from fuji. I needed such a lens as I was going on holidays and wanted an all-rounder but my main goal is to do portraits. – or a 55 1.8 sony zeiss + a 85 1.8 sony, both serious lenses as sharpness and bokeh goes. I would prefer 1 amazing lens, but I am affraid a close up portrait would show to much distortion at 50 mm. That is why I was going for the 55 mm for more buste and head to toe portraits, and the 85 mm for more close up work. what do you think, does my reasoning makes sense ? 55mm and 85mm would be too close together for me. I would be getting the 85 first to see if you really need a wider fast lens. That was another point of concern. I’m used to work with a kind of 50 mm (a 35mm 1.4 from fuji, which should be around 50 in FF), but at the same time, never really took the chance to do real headshos. I do leave really well with a 50. It covers most of my needs. But headshots might be a problem. Maybe I should wait for a more extreme difference, like the 135mm 1.8 GM, and go for a 50 1.4 in the meantime. added, thanks for pointing it out.